These days, it can seem like there’s a podcast for basically every conceivable topic. As proof of that, now, even Trader Joe’s has a podcast. 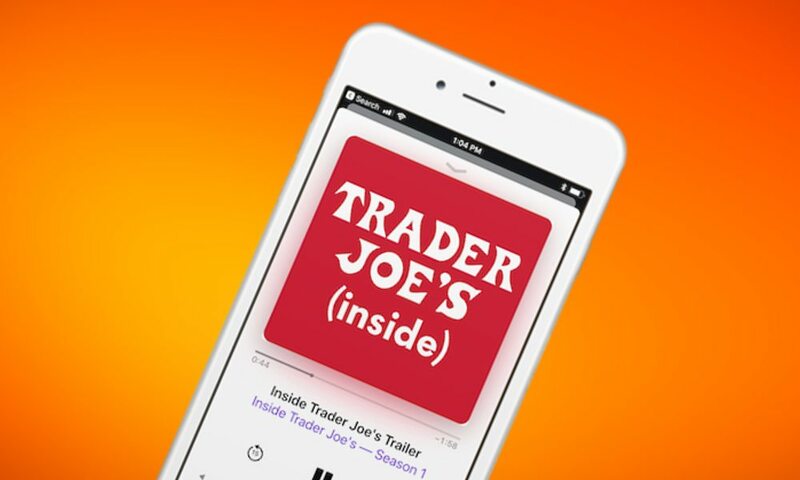 And like most things that the cult-favorite grocery store makes, the podcast — dubbed Inside Trader Joe’s — is really popular. It launched this week, and since its unveiling, it’s been hovering between third and fifth place on the Top Charts on Apple’s Podcast app. The show is hosted by Trader Joe’s Marketing Director, Tara Miller, and the company’s Vice President of Marketing Product, Matt Sloan. And while the iconic grocery chain doesn’t air commercials of its own, Sloan promised listeners that Inside Trader Joe’s is not some sly “long ad” for the company. Trader Joe’s, which has garnered a reputation for its low-price yet high-quality foods, is undoubtedly pretty popular. If you’re a fan yourself, you may have wanted to “take a peek” behind the curtains of the chain. If that sounds like you, you should give Inside Trader Joe’s a listen — the podcast reveals a slew of never-before-heard secrets about the cult chain. Here are just a few fun facts that the podcast has revealed about the grocery chain. Trader Joe’s keeps its cost so low because about 80 percent of its products are “private label” — in other words, an in-store brand. Rather than toss out leftover food, Trader Joe’s actively donates about 70 million pounds of uneaten food to charities and groups that fight hunger. Trader Joe’s actually has people fly across the world to taste and try new flavors and ideas for its products. Trader Joe’s Mandarin Orange Chicken has been the company’s most popular product for about nine years straight. Staff who work in the wine department routinely enjoy “really, really long wine tastings.” Which sounds like a great gig to us. If you’re a Trader Joe’s fanatic, or you simply like interesting podcasts, Inside Trader Joe’sis well-worth a listen. You can check it out here.